Farmer Jane knew from the gecko that it would be one of those days. It started with a call from her neighbor: the bobwire fence that divided their pastures was down, and the fast majority of her cows had ventured next door for a visit. “I’d be internally grateful if you could fix that fence right away,” the neighbor plied. Farming is a tough road to hoe, Jane thought. She hung up the phone and poured herself a glass of milk. To her dismay, it was skimp milk—darn her husband’s diet! No sense in griping, though. The milk was a mute point. Jane decided it was time to cease the day and hone in on her morning’s task of fence mending. You probably didn’t know it, but as you read through Jane’s entry, you were gathering eggcorns. And, no, I’m afraid you can’t eat them. An eggcorn is an alteration of a word or phrase in which the correct word is replaced with a similar sounding word that also makes sense (well, sort of). For example: “ex-patriot” instead of “expatriate” or “mating name” instead of “maiden name”. I found a whole list of eggcorns here, and some made me laugh out loud. Can’t wait for a luncheon! (by Mother Necessity, of course). After all, a gal can get mighty hungry come mid-morning. 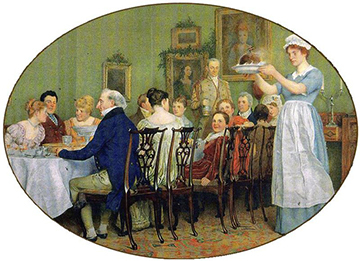 At the beginning of the nineteenth century, breakfast often occurred well after sunup, and dinner came along in mid-afternoon, so lunch as we know it wasn’t really an issue. But as time went by, dinner got pushed back hour-by-hour, and, well, you can see the obvious problem. “Luncheon” began to light upon the tongues of the hungry, but some cynical soul deemed it a vulgar term. Somehow, nuncheon (which may have been pronounced noon-shine) was easier on the ears.